B&N Opens New Concept Store in Vernon Hills, Ill.
Barnes & Noble has opened a 17,400-square-foot new concept store in Vernon Hills, Ill. The Chicago Business Journal reported that the location features oak bookshelves and wood grain tile floors; two large "book theaters" where customers can explore new books in what the company is calling a "360-degree experience"; a children's section with a dedicated Lego table; a 700-square-foot flexible event space that will be available for author events and book signings; and a cafe offering Starbucks coffees and teas along with baked goods, sandwiches, salads and snacks. Staff will be equipped with tablets, and self-serve kiosks are available throughout the store. Carl Hauch, v-p, stores, for B&N, said, "The new store will combine the best of what we've learned from our other new stores, and we can't wait to open our doors and showcase our full assortment of books, as well as the selection of educational toys and games, family games and puzzles and curated gift items for avid readers." Amazon will increase its minimum wage to $15 for all full-time, part-time, temporary (including those hired by agencies) and seasonal employees across the U.S., effective November 1. 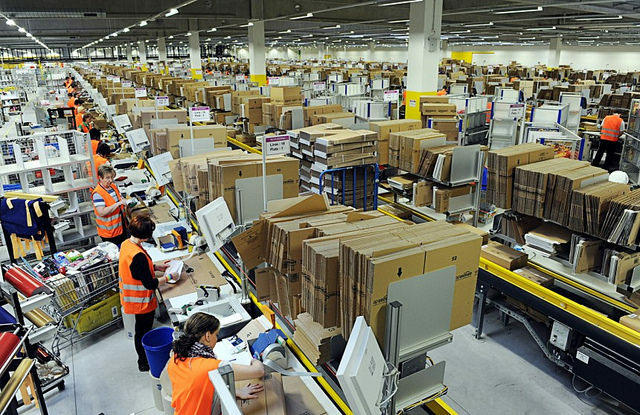 According to the company, the move benefits more than 250,000 employees, as well as some 100,000 seasonal employees who will be hired at Amazon sites across the country for the upcoming holidays. "We listened to our critics, thought hard about what we wanted to do, and decided we want to lead," said Amazon CEO Jeff Bezos. "We're excited about this change and encourage our competitors and other large employers to join us." Amazon's public policy team will also begin advocating for an increase in the federal minimum wage. "We will be working to gain Congressional support for an increase in the federal minimum wage," said Jay Carney, senior v-p of Amazon Global Corporate Affairs. "The current rate of $7.25 was set nearly a decade ago. We intend to advocate for a minimum wage increase that will have a profound impact on the lives of tens of millions of people and families across this country." 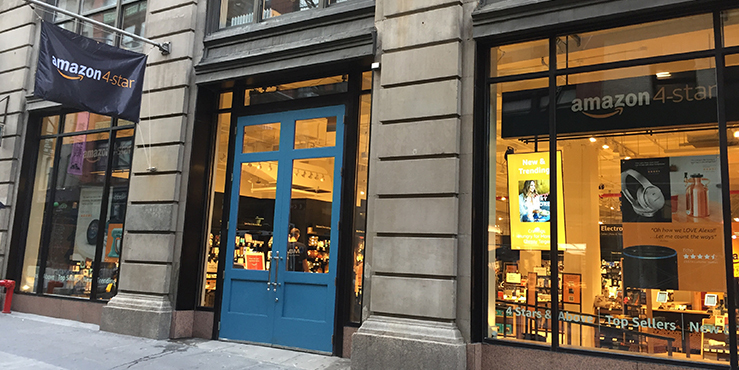 Amazon's latest experiment in retailing--the "four-star store" that opened late last week in New York City--has been described variously as "something like a refreshed version of a Brookstone store," "reminiscent of a novelty gift store," and "half bookstore and half Kmart" (the first two by the Wall Street Journal and the third by CNET). The store specializes in some 2,000 products that are rated four stars by online customers. Consisting of "a rotating hodgepodge" of books, toys, homewares and electronics, the opening selection included "his and hers mugs, candles, teapots, pet toys, Star Wars droids and vegetable peelers," the Journal reported. CNet noted that the "most wished-for" items table near the front of the store included a copy of The Subtle Art of Not Giving a F*ck by Mark Manson, a Nintendo Switch controller and a Harry Potter Lego set. Sections include top-selling items in New York City books, trending items in New York City (including a yoga mat, a dust buster and Fear by Bob Woodward), books with more than 4.8 stars and items frequently bought together. Like Amazon Books, there is a large section of Amazon's electronics devices. Prices are indicated digitally so that they are easily changed as the prices change online, and as at Amazon Books, Prime members receive a discount while non-Prime members pay list price. "Unlike the web experience, the store offers a chance to test-drive electronics and discover products by wandering through the displays and shelves, said Mr. Janes. 'You don't have to do the filtering yourself because we've done it for you.' "
In Canada, Amazon plans to open a new Lower Mainland fulfillment center on Tsawwassen First Nation lands. The 450,000-square-foot facility will join the company's existing British Columbia facilities in Delta and New Westminster. This will be Amazon's third fulfillment center in B.C., in addition to a tech hub in Vancouver. Glenn Sommerville, director of Amazon Operations in Canada, expressed gratitude for "the network of support we've received from the Tsawwassen First Nation Executive Council, provincial and community leaders, and strong project partners dedicated to innovation." Chief Bryce Williams commented: "Tsawwassen First Nation welcomes Amazon to our Lands. This is a promising advancement that will continue to unlock the potential of TFN as a leading development partner and key economic driver in Metro Vancouver. Berrett-Koehler Publishers is on the hunt for a new chief executive officer, following the announcement from founder and longtime CEO Steve Piersanti that he will step down in mid-2019. For the past year, Berrett-Koehler staff and board members have been laying the groundwork for the selection process. The BK team will be looking at both internal and external applicants, and are asking for interested candidates to submit applications by October 17. In a letter to the company's authors, shareholders and stakeholders, Piersanti wrote that since founding the company in 1992, he has concurrently filled the roles of president, chief executive, publisher and editor. In recent years, he continued, "it has become increasingly difficult for me to do both jobs well." But before retiring fully in the middle of next year, he will continue to serve as a "full-time BK acquiring editor for books--which is the role I have always believed I was best at performing and which has given me the greatest satisfaction." One week remains to apply for the Carla Gray Memorial Scholarship for Emerging Bookseller-Activists. Applications will be accepted until October 9 for the year-long professional development scholarship that is intended to help a bookseller with fewer than five years experience connect with other booksellers, publishers and authors, and to establish the long-term relationships that keep the book industry thriving. The scholarship includes funds to attend Winter Institute 2019 and a 2019 fall regional trade show. The bookseller will also be granted funding to support a community outreach project of their own design. Organized by the Friends of Carla Gray committee and managed by the Book Industry Charitable Foundation, the memorial scholarship was officially launched in late May, on the one-year anniversary of Carla Gray's death. Hannah Harlow, Jenna Johnson and MaryBeth Long created the Friends of Carla Gray committee shortly after Gray's death and have been raising funds toward the scholarship. English children's book author and TV presenter John Cunliffe, creator of Postman Pat and Rosie & Jim, died September 20, the Bookseller reported. He was 85. Cunliffe published approximately 190 books for young children, including five volumes of poetry as well as numerous picture books and collections of stories. "John Left his Ilkley home in a deluge of rain on Thursday, September 20, never to return," his obituary in the Ilkley Gazette noted, adding that "even the skies wept for John." His last poetry collection, Dare You Go, "has now come to fruition for John has dared to go and he has gone." Director of BBC Children's Alice Webb said Postman Pat had been a "hugely popular" character on the network for nearly 40 years: "It's a world you'd like to be part of--a community that cares, is full of heart and full of fun--and that is a lovely thing to show audiences, both young and old. I count myself lucky to be one of millions of children whose childhoods were enriched by John's creations." Rachel Feldberg, Ikley Literature Festival's director, told the Bookseller: "We were honored to have John as Patron of our Children's Festival and I have wonderful memories of events he did with us. His work, particularly Postman Pat, was iconic for everyone who grew up reading, watching and loving those characters and will continue to delight children for generations to come." Underground Books, Carrollton, Ga., is already "getting in the Halloween spirit, and we're giving you all our scary, thrilling, frightening book recommendations for the season" with a book-themed parody of the Saturday Night Live digital short "Lazy Sunday" called "Spooky Bookstore," featuring store co-owner Megan Bell and "musical guest" Abigail Dawkins. "Thirteen years ago, Andy Samberg and Chris Parnell debuted a digital short on Saturday Night Live that changed the internet forever," Underground noted, adding that "13 is a very spooky number. It could even give you nightmares... in the city of dreams, which is what Carrollton is called according to Wikipedia! Isn't that a spooky number of coincidences?" Effective January 1, 2019, Lerner Publisher Services will be the exclusive distributor for Creston Books, Berkeley, Calif., whose first list appeared in 2013. Lerner Publisher Services will distribute three new nonfiction picture books and 32 titles from Creston Books to the trade and the school and public library markets, starting in spring 2019. The three new picture books include Beastly Biomes, written and illustrated by Carly Allen-Fletcher; Martin and Anne: The Kindred Spirits of Dr. Martin Luther King Jr. and Anne Frank by Nancy Churnin, illustrations by Yevgenia Nayberg; and Sweet Dreams, Sarah by Vivian Kirkfield, illustrations by Chris Ewald. "Creston Books takes time to work with their authors and illustrators to make the best books possible through editing, revising, and perfecting the authors' and illustrators' visions," said David Wexler, executive v-p of sales for Lerner Publishing Group. "This level of detail makes Creston Books a perfect fit for Lerner since we strive to make every book exceptional with thorough research, captivating writing, and amazing illustrations and photography that hold readers' attention." "Lerner Publisher Services is a wonderful fit for Creston Books because of their expertise in the school, library, and educational markets," Marissa Moss, editor and publisher of Creston Books, said. "Our lists complement each other well and we hope to expand our reach into new markets to get our books into the hands of as many young readers as possible." Sofije Brija has joined Workman Publishing as digital marketing and advertising assistant. Most recently, she was associate manager of customer service and social media at ESPN. She began her career as an editorial assistant at Holiday House. 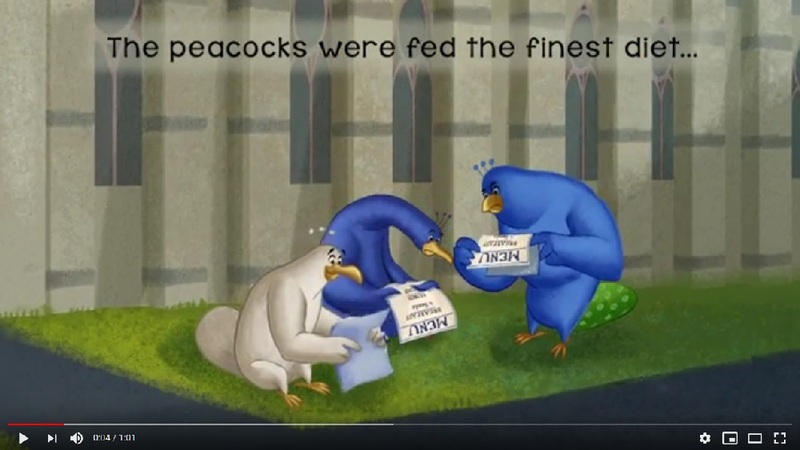 Book Trailer of the Day: No Peacocks! No Peacocks! A Feathered Tale of Three Mischievous Foodies by Robin Newman, illustrated by Chris Ewald (Sky Pony Press). NPR's Here and Now: Imogen Hermes Gowar, author of The Mermaid and Mrs. Hancock (HarperCollins, $28.99, 9780062859952). Fox News's Neil Cavuto: Tucker Carlson, author of Ship of Fools: How a Selfish Ruling Class Is Bringing America to the Brink of Revolution (Free Press, $28, 9781501183669). MSNBC's All In with Chris Hayes: Rebecca Traister, author of Good and Mad: The Revolutionary Power of Women's Anger (Simon & Schuster, $27, 9781501181795). Tonight Show: Gisele Bündchen, author of Lessons: My Path to a Meaningful Life (Avery, $28, 9780525538646). Anonymous Content has acquired the rights to the upcoming novel What if It's Us (Balzer + Bray/HarperTeen, Oct. 9), a collaboration between Becky Albertalli (Simon vs. the Homo Sapiens Agenda) and Adam Silvera (They Both Die at the End). Variety reported that the company has tapped 13 Reasons Why creator and Pulitzer Prize-winning playwright Brian Yorkey to adapt the book for the big screen. Anonymous Content's Joy Gorman Wettels, a longtime collaborator with Yorkey, is producing the film. Yorkey will develop the project alongside Wettels and Kat Ramsburg of Yorkey's That Kid Ed Productions. Albertalli and Silvera will also serve as producers. "What If It's Us is a sparkling romantic comedy, a love letter to New York City in the summer, and a moving, deeply honest look at what it's like to be a young person today," Yorkey said. "It's all the things I love, and I couldn't be more thrilled to be a part of bringing it to the screen." In a joint statement, Albertalli and Silvera said: "The universe couldn't have presented a more perfect dream team than Brian, Joy, and Kat. We immediately fell in love with their vision for this film, and we can't wait to watch them bring What If It's Us to life." Longlists for the 2019 Andrew Carnegie Medals for Excellence in Fiction and Nonfiction have been announced. Shortlists will be released October 24. Winning authors receive $5,000. The two medal winners will be unveiled January 27 during the American Library Association's Midwinter Meeting in Seattle, Wash. See the complete longlists here. Michael Silverblatt, host of Bookworm on KCRW in Los Angeles, is the inaugural recipient of the Deborah Pease Prize, created by A Public Space in the name of its late founding benefactor. The prize honors "a figure who has advanced the art of literature." Silverblatt, the organizers said, "has reinvented the art of literary conversation." 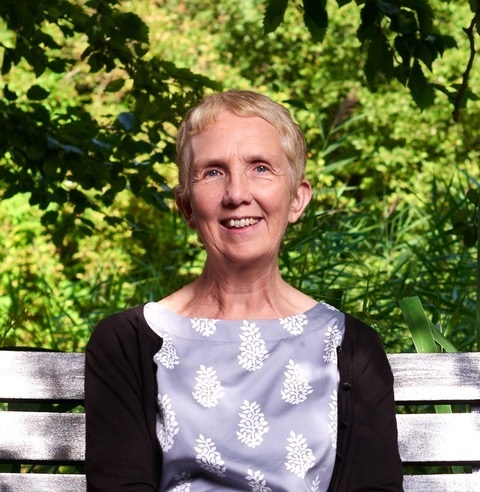 Silverblatt will receive the award at A Public Space's benefit on December 6 in Brooklyn, N.Y.
Ann Cleeves writes two series of crime novels, both of which have been turned into TV series airing on PBS. The Vera Stanhope books have been made into the ITV series Vera starring Brenda Blethyn. The Shetland novels feature Inspector Jimmy Perez and are being filmed by the BBC and titled Shetland. 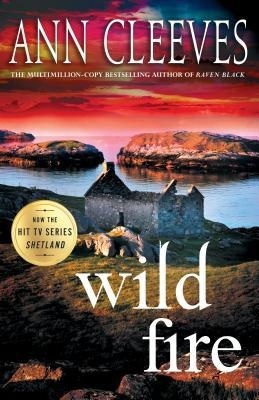 Raven Black, the first Shetland novel, won the CWA Gold Dagger; Wild Fire (Minotaur, September 4, 2018) is the final entry in the series. Cleeves lives in England. I'm reading Laura Lippman's Baltimore Blues at the moment. I've just come back from the Harrogate Crime-Writing Festival in Yorkshire and she was appearing there. This is an early book and I love it. There are piles of books on the nightstand waiting to be read, so I'll just pick one more--a proof copy of A House of Ghosts by W.C. Ryan. His last book, The Constant Soldier, was one of my recent favourites. Swallows and Amazons by Arthur Ransome. It had everything I wanted to spark my imagination: a wild and exciting place, friendship and adventure. Sara Paretsky. I admire her courage and wish I was more like V.I., her central character. Louise Penny. I've known Louise for many years, in the way that writers bump into each other at book festivals and events, and we've become friends. Her Three Pines books are deceptively simple, but the moral dilemmas explored are complex and challenging. Arnaldur Indridason. My reading passion is crime in translation, and one of my favourites is Icelander Indridason. Alain-Fournier. Another translated author, but this is very different. The Lost Domain (Le Grand Meaulnes) is his only novel. It's a rite-of-passage book about love and friendship written at the beginning of the 20th century. I love his depiction of the French countryside. 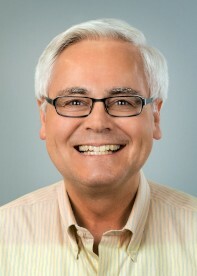 Graham Swift. A wonderful writer who captures place beautifully. Ulysses by James Joyce. I've started reading it several times and really got into the swing of it, but never quite finished it. Little Deaths by Emma Flint. This is a fabulous debut novel. Although the author is English, the book is set in Queens, N.Y., in the '60s, and the description of place and the dialogue feels authentic. The Northumberland Coast by photographer Joe Cornish. I love the county of Northumberland, where I live. It runs from the River Tyne to the Scottish border. This is full of wonderful images of home. When I was a child, at night I hid everything, because I read on in bed much later than I was allowed to. During the day, I hid nothing. My parents were very open-minded and never censored my reading or decided what might be age-appropriate. A collection of G.K. Chesterton's Father Brown short stories, discovered in my library. It turned me on to detective stories for adults. Before that I thought mysteries were only for children. "Only connect" --from Howards End by E.M. Forster. We still need to break down boundaries of class and wealth. Hilbre: The Cheshire Island: Its History and Natural History. When we were first married, my husband and I lived for four years on this otherwise uninhabited tidal island and it reminds me of being young and the great adventure. The RSPB Handbook of British Birds by Peter Holden and Tim Cleeves. My husband collaborated on this book. He was a passionate birder and it reminds me of him. A Maigret Omnibus by Simenon. I stole this book from an elderly couple and still feel dreadful about it. (I borrowed it and never gave it back). It would feel even worse if I gave it away. The collected novels of Smollett. These very old books were given to me by university friends for my 18th birthday. I've never read them, and we packed them up every time we moved. It's too late to part with them now. A Bird in the Hand by Ann Cleeves. This was my first novel, published in 1986. I was so excited to receive it. I have two copies of the first edition, one for each of my daughters. Gaudy Night by Dorothy Sayers. Not a great mystery, but a romantic love story. 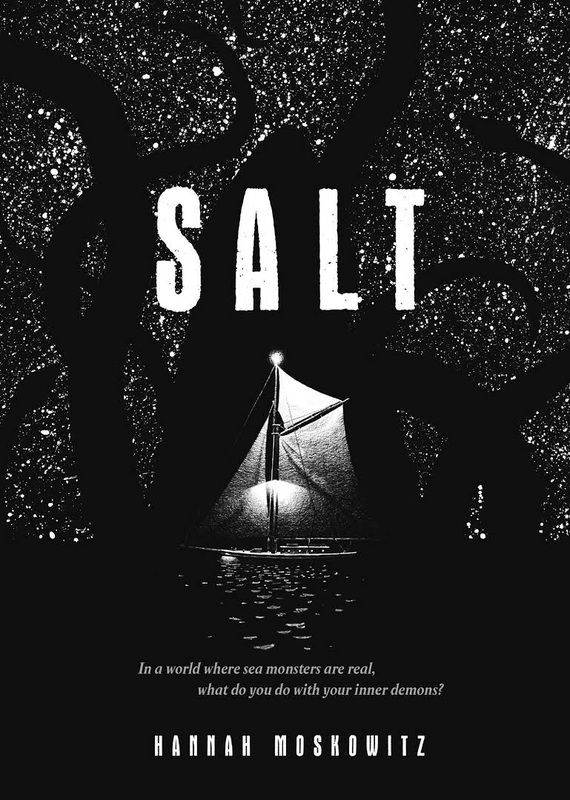 Hannah Moskowitz's (Zombie Tag) newest work for young adults, Salt, features two teen siblings working together to raise their little brother and sister while sailing around the world, and seeking out and killing sea monsters. Until just a few months ago, Beleza, Indi, Oscar and Zulu lived on a boat with high-tech equipment and modern amenities, traveling the seas with their parents. Their mom and dad were sicarios: poachers who hunt sea monsters for prestige, sport and (sometimes) money. But then Mom and Dad went away, saying they were off to check on the family treasure, leaving behind only their travel journal. The four siblings haven't seen them since. Now, Beleza, Indi, Oscar and Zulu, who speak an in-family language that is an amalgam of Arabic, Greek, Spanish and French, are all alone on a ship so small they "can't breathe without getting air that's just come out of someone else's mouth." The "whole boat is pretty much a piece of crap," Indi's first-person narration says, "but our good boat, our real home, disappeared along with our parents, and all we could afford with the money they left was this third-rate fifteen-meter wooden schooner." Elder sister Beleza has taken on the role of captain, while 17-year-old Indi is first mate and caretaker, and the two are doing their best to hunt the seas and raise "the kids," 12-year-old Oscar and six-year-old Zulu. Zulu butchers all the catches and "does most of the weaponry; Oscar, despite how surly he is... charms locals and tourists alike and keeps food in [their] stomachs." Indi, whose love for his siblings "sweeps [him] away like a tide," wants something more than this life for them--he wants them to go to school, get away from the search and slaughter of monsters, be given the chance to be children (himself included). Beleza, however, has one driving focus: revenge. She wants to use the travel journal to figure out where their parents went so they can find out which monster likely killed them and kill it in return. When a stop on land for information unearths a pretty Tunisian pirate named Hura and rumor of a giant, unkillable monster called El Diamante, the siblings' already dangerous world becomes all the more perilous. Shelf Talker: Four siblings sail the seas, fighting monsters and seeking their missing parents, in Hannah Moskowitz's irresistible YA novel Salt.